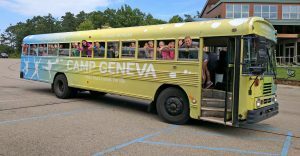 GENEVA Day Camp engages a child’s sense of curiosity, fun, and adventure. Energetic and compassionate counselors walk side-by-side with campers through fun-filled days of pool time, crafts, outdoor games, and worship. This beginning experience is a great opportunity for campers to learn more about God and His wild love for us. Special guests Joel Schoon Tanis and Steve Carigon will join us this week to help campers experience a high-energy, art-filled, creativity-inspired week. These are special sessions where all 3rd & 4th grade campers will stay over Thursday night in cabins for a fun-filled taste of overnight camp. Evening activities, sleeping in a cabin, and camp meals over the fire and in the dining hall make this experience extra special. This experience, open to 2nd-4th graders, is for children in Spanish Immersion school programs or whose families are native Spanish speakers. Bringing together Spanish Immersion Students and the West Ottawa Summer Migrant School sets the tone for a day of camp that crosses cultural and linguistic boundaries. Bilingual camp staff eagerly share about our unity in Christ while leading worship, Bible study and activities in Spanish. Drop your child off at the GENEVA Center between 7:30-8:00am. They will eat breakfast with the Day Camp staff and then go to the area they’ve been assigned to for the week and have a chance to play on the playground while the other campers are arriving. $20 for the week ($15 for Sessions D4 and D10). All lunches will be refrigerated. We will provide milk at lunch and both a morning and an afternoon snack each day. Please note: Day Camp is PEANUT FREE so please do not send anything containing peanuts or peanut products with your child. Lifejacket, if needed. If a camper comes with a lifejacket, he/she will be required to wear it and stay in the shallow end of the pool. Once your child is registered, you will receive a complete Day Camp Confirmation Packet with everything else you need to know before coming to camp, including directions, check-in and closing program times, etc. Campers should eat breakfast before arrival each day unless they are signed up for early drop-off. This Printable Day Camp Confirmation contains all the information you need to know before your week of camp except for your personal information. We will provide busing both ways every day except on the last day, we will only provide busing in the morning. Parents are encouraged to come for the closing program at 4:30pm and sign their camper out with the counselor after the program ends.